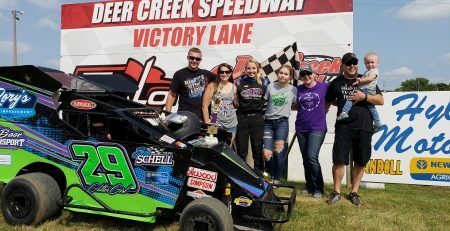 It was an absolute picture perfect day at Deer Creek Speedway for the 39th Annual Bigelow Homes Gopher 50. The beautiful weather brought a huge crowd to witness the show. The USRA Modifieds were on the program for the Gopher 50 along with the World Of Outlaws Craftsman Late Models. 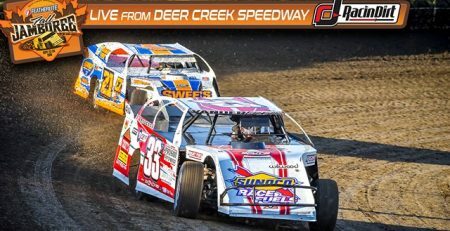 This was the 21st consecutive year that the Modifieds joined the Late Models in the annual summer classic. The show was sponsored by Bigelow Homes, Miner’s Outdoor & Rec, Tralo Companies, Carroll’s Corn & the Rochester Eagles Club. 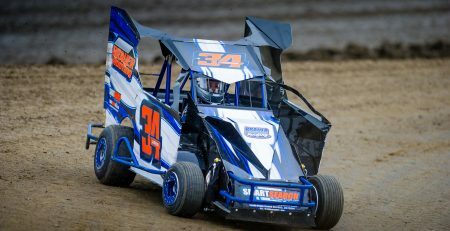 Carroll’s Corn added money to the Modified purse and also offered a $500 hard charger award for the feature. The also awarded the top two in passing points with a $300 and $200 bonus. Tralo Companies presented the top eight in passing points with a challenge. Starting with the top passing point driver, they had the opportunity to start eleventh or twelfth for a $5000 bonus on top of the $5000 winners share if they won the A-Main. If they were not successful they would receive $250. During the program Josh Ihlenfeld owner of Tralo Companies informed race officials that the bonus had been increased to $10,000. So if the driver accomplished the feature and won, that would be a $15,000 payday. 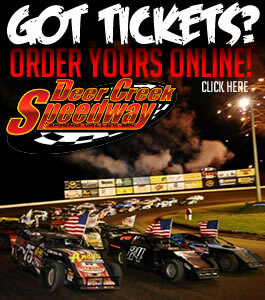 Forty-eight Modifieds signed in and ran five heat races with the top 12 in passing points transferring to the feature. Three B-mains would transfer four cars each to fill out the 24-car starting field for the 35-lap feature. At intermission the top eight drivers in passing points were in front of the crowd for the redraw. Brad Waits was first up and immediately accepted the Tralo Challenge and would start 11th. Rodney Sanders declined the offer, but Jason Krohn who drew third took the challenge to start 12th. Zack Vandebeek got the pole with Nate Wasmund on the outside. Vanderbeek took the early lead and quickly opened up a lead. Wasmund ran second and sixth starter Rodney Sanders quickly shot to third. Jake Timm who started 10th slipped past his father Bob shortly before a lap five caution slowed the race. Another caution on the start kept things tight. Sanders then challenged Wasmund for second when the green flag flew. Sanders got there and Jake Timm also snaked past Wasmund for third. The driver on a mission was Stormy Scott who started 15th and cracked the top five on lap seven. Vanderbeek opened up the lead once again while Scott continued to drive towards the front. Scott was fourth on lap eight and Jason Krohn also made progress and was just outside the top five. A yellow on lap nine erased Vanderbeek’s huge advantage. The race resumed and Vanderbeek again took off. Wasmund got by Scott for fourth but that was short lived when Scott returned the favor. Jake Timm was on the move and slipped past Sanders for second on lap 13. Scott was now on Sanders for third and pulled off the pass on the sixteenth circuit. Vanderbeek was still comfortable out front at this point while the race for second heated up. Scott caught Timm and took second on lap 20 and Krohn entered the top five. Vanderbeek had a straightaway lead when Scott moved to second. But Scott would shave two tenths of a second off the lead just about each lap. Scott closed in but Vanderbeek got away just a bit in lapped traffic. With a couple of laps left Scott gained four tenths and was on Vanderbeek once again. Things got interesting in the final couple of laps when Scott made a last ditch run for the lead. Vanderbeek held him off for the win in the debut of his brand new race car. Vanderbeek became only the third driver to win more than one Gopher 50 title. The champion also took home the unique wood carved gopher trophy and Husqvarna leaf blower from Miner’s Outdoor & Rec. Scott came home second with Timm third. Sanders ended up in fourth and Krohn was fifth.